The Deliberate Agrarian 2.0: I'm On Day 5 of The Whole30 Diet... Ain't So Bad! Hi Herrick, When I first started following you on the net I was a rather tubby person. I am 5'10" and tipped the scales at 228 pounds. After having two knee replacements, a heart vale replacement six years ago, I figured I had better do something about the weight if I wanted to see any of the grand kids get married and have babies. I looked around at alternatives to the diets you see on the tube because I had tried them all. Weight Watchers, Atkins, South Beach, Nutri-System, and a few others. Well I came to the realization that there was nobody going to do this for me! It had to be done BY me. If I couldn't Develope enough fortitude and guts to do this by myself it would never happen. So I went online and found a "diet tracking application". It is called My Net Diary and you can eat any damned thing you want to BUT, and it is a big But, you have to list under every meal and snack, every single thing that you put in your mouth calorie wise! And it has to be done religiously.This app will track all the nutrients that you intake and show you where you are deficient or eating to many . The first thing you do is set a goal, and be sure to make it a realistic one. I did mine in five pound increments,and gave my self adequate time to reach that goal, like about two weeks. I weighed myself every day at 0500 in the morning after making whatever deposits were necessary in the head (bathroom). Well at the end of the first week a pound and a half had gone and I was so impressed that it actually worked that it gave me the incentive to keep at it. Restraint, and watching and counting every single calorie I in-took did the trick. Last summer in June after eighteen months I reached my final goal of 160 pounds which was only 11 more than when I joined the US Navy in 1956 at 149 lbs! So I was real happy and have learned how to size portions of food and drink. I still keep up the record every day, every meal, every snack, and I am maintaining the 160 goal. All this brings me to this, Almost all of my chronic aches and pains have disappeared! No more indigestion/acid reflux which was a bane of my life, VERY much more ambition and the ability to move around and just do stuff. I start out the door by 0530 every day and continue to do "stuff" till at least 1500 in the afternoon. My cholesterol reading went through the floor, BP went down to 125/80 heart rate thumps away at about 52-56 a minute resting. I am now actually in pretty darn good health except for the hearing and the ARMD of the eyes. Nothing to be done about either of those. But while I'll be turning 80 in four months, I am so thankful that I am able to do all that I do!! And this friend of mine , a Mister Herrick Kimball makes it all so much easier to get done with all the time savers and easy ways of doing everyday chores! So thank you sir, and I wish you much luck in your weight loss endeavor! That is a GREAT and inspiring story! I think you may have achieved "tiger blood." Now I know how you are so productive. I'm an inch shorter than you. I didn't weigh myself before starting this Whole30 diet, but I think I was around 190. I weighed 145 the day I was married, back in 1980. I would like to get down to 160. One of the "rules" with Whole30 is that you can not weigh yourself until day 30. But now, at day 7, I'm sure I've lost some weight. If this effort doesn't get me the results I desire, I'll check out the App you mention. Sounds like a great idea. I saw your Timber Claws Video, you have definitely lost weight. Please report on Tiger Blood and how you feel. I assume it is some kind of energy rush, or do you crave meat? Heard about diets that do both. You lost me at no dairy. Life is too short without half'n'half in my morning cup of coffee and some occasional extra sharp cheddar cheese (sometimes while sipping my own "whizbang" hard cider). Acutally, this diet sounds sort of like the "paleo" diet. 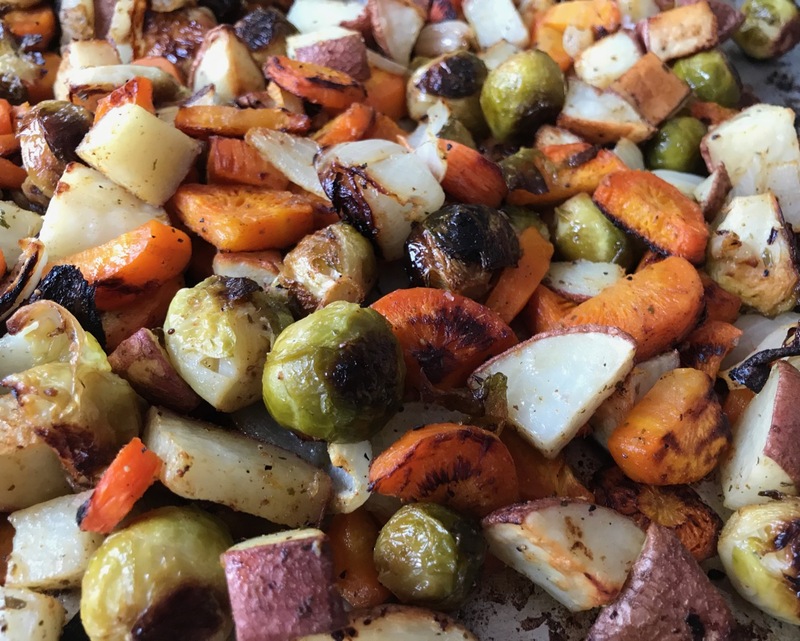 I'm with you on the roasted vegetables though - my wife makes roasts them all the time and they are delicious - toss some beets, carrots, potatoes, onions, etc. together - good stuff! Best of luck with the new diet! 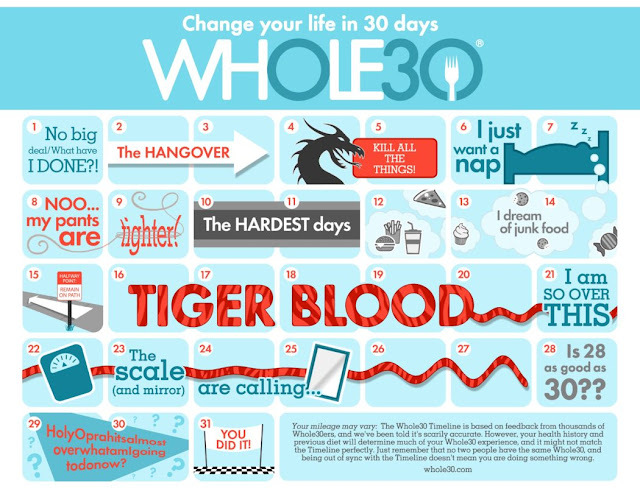 "Think of the Whole30 like pushing the "reset" button with your health, your habits, and your relationship with food. Our premise is simple: certain food groups could be having a negative impact on your body composition, health, and quality of life without you even realizing it. Are your energy levels inconsistent and nonexistent? Do you have aches and pains that can't be explained by overuse or injury? Are you having a hard time losing weight no matter how hard you try? Do you have some sort of condition (like skin issue, digestive ailments, seasonal allergies, or chronic fatigue) that medication hasn't helped? These conditions may be directly related to the foods you eat—even the "healthy" stuff. So how do you know if (and how) these foods are affecting you? Eliminate them from your diet completely. Cut out all the psychologically unhealthy, hormone-unbalancing, gut-disrupting, inflammatory food groups for a full 30 days. Let your body heal and recover from whatever ailments those foods may be causing. Push the "reset" button with your metabolism, systemic inflammation, and the downstream effects of the food choices you've been making. Learn once and for all how the foods you've been eating are actually affecting your day to day health, and your long-term health. For 30 days, the program eliminates foods demonstrated by science and our experience to promote unhealthy cravings and habits, disrupt your metabolism, damage your digestive tract, and burden your immune system. After 30 days you carefully and systematically reintroduce those foods, and pay attention to how they impact your cravings, mood, energy, sleep, digestion, body composition, athletic performance, pain, and the symptoms of your medical condition. With that knowledge, you can then create the perfect diet for you; a nutrition plan that feels balanced and sustainable, grounded in new healthy habits, keeping you looking, feeling, and living your best." None of that may apply to you now, but keep it in mind. I think there are a lot of people who could benefit from this approach instead of just going to the Dr. and getting a pill, if you know what I mean. One thing for sure... those roasted vegetables are good food! You might try coconut milk ( top of the can) or coconut cream in your coffee ( it's a good fat :) ). Also, stevia drops or a sweetener such as truvia. If you want froth in your coffee add a pinch of lecithin powder and froth in blender. I got these ideas from Trim Healthy Mama, which Marlene might enjoy looking up. They have great recipes too. The stevia is an big no-no with Whole30. Marlene says that we have to "slay the sugar dragon." No additional sweeteners are allowed. Only the natural sweeteners that are in the approved foods. Marlene has heard of Trim Healthy Mama. Someone she knows is a big fan. I'll check it out. Hi Marney, Does the coconut milk separate like regular cows milk does? I also use trivia in the coffee. I am interested in elimination diets and what people notice changes. I found that gluten didn't agree with me and due to the bloating etc I cut it out. The unexpected benefits was a loss of the stiff joints on waking in the morning, loss of the afternoon drowsiness and constant mental fogginess. Additional benefit was 10% weight loss. I wasn't celiac, but I've chosen to avoid gluten for several years simply because the benefits outweigh the inconvenience. I'm now on day 23 of the diet. I feel good and am sure I've lost some weight (but weighing is not allowed until day 30). I'm also sure I feel better than I would if I was not on this diet, but I have yet to get the Tiger Blood. I've told Marlene that if she is willing to keep fixing the approved meals, I'm willing to go 60 days. This diet makes sense to me. Thanks for asking.